That plan, put simply, divided military modernization into three “horizons” or phases – the first from now till 2017; the second from 2018 to 2023; and the third from 2024 to 2028. Under the first horizon, which we are now in, the military had requested around 90 billion pesos, and, according to del Rosario, has been given close to that amount – 83 billion pesos. Beyond the amount, the projects under the first horizon have already been selected for the Air Force, Navy, Army and general headquarters, and they include fighter jets, frigates, helicopters, radars and base upgrades. Indeed, due to the delay in securing approval from the government, some of these projects have already gotten underway. So, to be clear, what is new is the amount that has finally been officially approved, rather than the plan itself or what is already being bought under it. Second, as I have written about other Southeast Asian states as well, it is wrong to think about military modernization as solely being directed at China (See: “Malaysia’s South China Sea Approach: Playing it Safe“). That’s not just a copout or a diplomatic nicety. The Philippines faces a range of internal and external challenges – including insurgencies, natural disasters, unresolved territorial and sovereignty issues with neighboring states, and a significant lag when it comes to keeping up with the Joneses in Asia more generally. While Chinese aggression in the South China Sea often grabs the headlines, it is only part of what military planners have to think about. That means Philippine capabilities are directed not only at one threat, but several at one time. Without getting too far down in the weeds, the big picture point to take away from the purpose of military modernization is that it seeks to increase the Philippine military’s ability to counter not only internal threats, but a range of external threats in a more decisive manner. Like other nations, this includes – but is not limited to – China. Third, even as the Philippines builds up its capabilities over the next few years, it will take a long time for it to catch up to some of neighbors, not to mention China. While Manila’s military modernization efforts under the Aquino administration have been vigorous relative to anemic periods in the past, the fact is that the Philippines is one of Asia’s weakest militaries and is building from a very low base. The U.S.-Philippine alliance has no doubt been a big part of how Manila thinks about its defense, though those familiar with the history of the relationship know full well that the Philippines’ excessive reliance on — and, at times, shaky commitment to — Washington in the past has also been an issue (See: “What’s Next for US-Philippine Defense Ties?“). Even military officials are quite candid about the long road that lies ahead. The short term goal that defense planners have been talking about is achieving ‘minimum credible deterrence.’ Even further out, as Major General del Rosario so aptly put it, the goal is not to defeat China, but to make any state think twice before attacking and ensure that it “ends up with a bloodied nose” if it does. In terms of specific capabilities to achieve even these limited goals, Manila is only partly there so far. 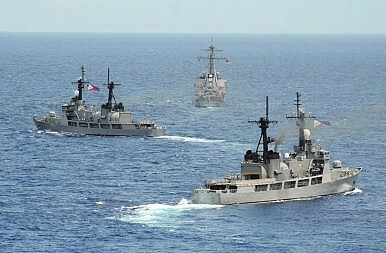 Defense Undersecretary Fernando Manalo said publicly earlier this year that the fighter jets being acquired under the first horizon are “way below” what is needed by the Air Force, while Defense Assistant Secretary Patrick Velez has said that the Philippine Navy needs at least six frigates to build credible deterrence. Major General del Rosario was also quite honest in saying that the goal once the plan is completed is a rather modest but important one of having complete awareness of what is happening in disputed areas in the South China Sea to enable Manila to respond more quickly. Fourth, and on a related note, one should maintain a healthy skepticism when it comes to linear projections of military modernization. The ‘three horizons’ conception of Philippine military modernization makes it seem like there is a fixed conception of how this will play out in the coming years. In reality, while there is consensus around the general idea that the Philippines should strengthen its defense capabilities, the outgoing Aquino administration’s commitment to doing so may not be shared to the same degree – or may play out in a different way – under its successors following the 2016 elections. The extent to which future administrations are able to continue this goal is also dependent not only on their own preferences, but the circumstances that inform them. To take just one simple example, the Aquino administration has been able to earmark growing funds for defense partly because the Philippine economy has been doing quite well over the past few years. While one hopes this trend will continue, there is no guarantee that it will or that a future administration will be committed to shielding defense from cuts should they be required (See: “What’s With the Philippine Economy?“). All this should not detract from the importance of the Philippines’ ongoing military modernization, which is long overdue. It should also not lead one to consider this trend in isolation rather than in tandem with the other tools of Philippine statecraft and its defense relationships with other allies and partners. But it should temper the expectations of those getting much too excited about Manila’s defense buildup now lest they end up being disappointed further down the line.